After laughter comes tears. At least that’s what Wendy Rene sang in 1964 and over fifty years later, those lyrics still ring true in our farcical age. Of course, “After Laughter (Comes Tears)” is just one of many songs that take up crying as its subject, joining others like “The Weeping Song,” “96 Tears” and “Crying,” which was translated into “Llorando” by Rebekah Del Rio in David Lynch’s Mulholland Drive, combining my two favorite Lynchian tropes: crying in clubs and torch songs. Similarly inspired by too many teardrops, a current group exhibition Tears Then Holes at Rachel Uffner Gallery sobs, weeps, sniffles, snivels and bawls. 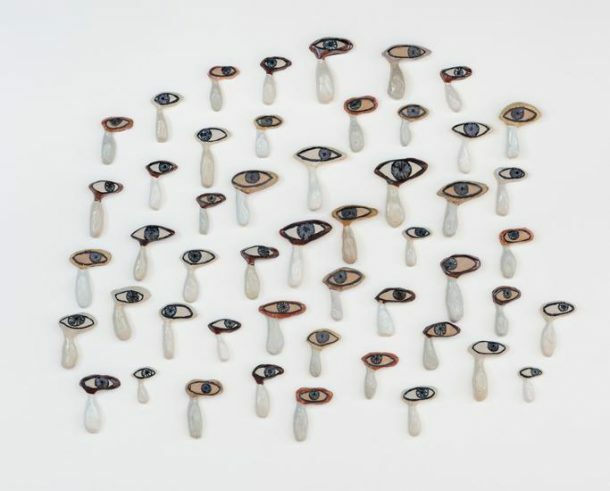 The show’s theme largely originated with artist and co-organizer Pam Lins’s Crying Eyes, a series of singular eyes with one tear that she’s been making every Monday during the Trump administration. This ode to weeping doesn’t end there, however, with other inclusions ranging from Nicole Eisenman’s works on paper, including one (literally titled 1) featuring a person drinking their own tears, to Tony Feher’s wall-mounted line-up of plastic bottles filled with various shades of blue to Christine Wang’s painting of Johnny Depp’s juvenile delinquent character from our preeminent filth elder John Waters’s Cry-Baby emblazoned with the phrase “I wish I had a white boyfriend.” It’s an ironic wish in conversation with Depp’s recent slide into drunken and abusive batshittery. Tags: Anne Collier, Christine Wang, Cry Baby, crying, Filthy Dreams GIF review, GIF art criticism, GIF art review, GIF criticism, GIF review, Lisa Robertson, Nicole Eisenman, Pam Lins, Rachel Uffner Gallery, Ricci Albenda, Serenity Adams, Tony Feher. Bookmark the permalink.